1. What is Wishbone Day? 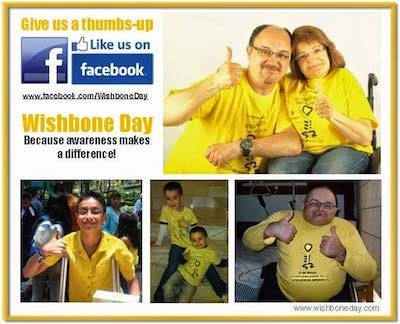 Wishbone Day is a social movement organised by people with OI. Wishbone Day is not a fundraising event. Wishbone Day is not an organisation or an association and has NO paid staff, sponsorship or funding contributions. Wishbone Day is the collective voice of people with OI, talking about OI and the things that matter most to them, in their own way. Wishbone Day draws awareness to the contributions of people with OI, the challenges of living with OI, and the important ways that people can contribute to our journey to live full and happy lives. Wishbone Day is on May 6th. Wishbone Day has grown to be the largest community awareness effort ever for the Osteogenesis Imperfecta (OI) community. You can learn more about the Wishbone Day spirit and where it all began here. 2. What is Osteogenesis Imperfecta (OI)? Osteogenesis Imperfecta (OI) is a genetic condition that cause bones to break easily. OI is also known as “brittle bones”. A person is born with OI and will have OI throughout their lifetime. You can learn more about OI by visiting any of the OI associations around the world. We've provided some links to help you find the one nearest to where you live. If you can't find what you're looking for send us an email and we will do our best to help link you to a OI community near you. 3. How did Wishbone Day come about? At the bi-annual OI Society of Australia Conference in 2008, Jo Ragen was invited to facilitate a strategic planning session with attendees about what they most wanted from their OI community. Wishbone Day grew from discussions with young people and adults with OI, and their family and friends. Here, people talked most passionately about having their voices heard about the things that mattered most to them in their daily lives. Jo Ragen compiled all the suggestions, analysed the challenges and opportunities, and designed the platform on which Wishbone Day could be established. 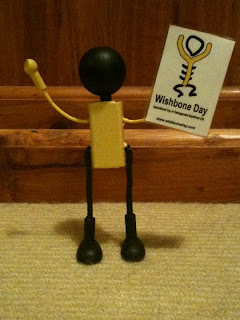 Wishbone Day was launched in 2010 and was quickly adopted worldwide as the official international awareness day for OI. Wishbone Day belongs to everyone with a desire to celebrate the lives of people living with OI. It is now recognised in more than 90 countries worldwide, with more joining every year. Each year Wishbone Day grows in size through the conversations and contributions of people from all over the world. Wishbone Day yellow shines with optimism and carries the promise of a positive future. Wishbone Day yellow is a symbol of that promise. Side note: The symbolic Wishbone Day yellow was selected by the most junior members of our OI community. They decided that yellow best represented the colour of a wish and was the happiest colour in the pack. We couldn't argue with that! The children in our group also decided that we should all wear a yellow Wishbone Day shirt. Doing so could make it easy for us to find each other. Point taken! 5. Why do some of the OI events use blue? OI fundraising events use blue. Wishbone Day is not a fundraising event. 6. Why is Wishbone Day important? Because awareness makes a difference! and because people with OI should be the ones that decide what is most important and how conversations about OI should be had. 7. Can I raise money through Wishbone Day? No. Wishbone Day is not a fundraising event. 8. What if I want a Wishbone Day T.Shirt? 9. Can I sell my own Wishbone Day items? No. Wishbone Day items must not be mass produced or sold to for profit or fundraising purposes. (See FAQ item 1 and item 7 for more information on fundraising). 10. What if I'm not into making my own stuff, can I buy Wishbone Day items already made? Yes. You can buy Wishbone Day t.shirts and other items from our online Wishbone Day store. There is no fundraising profit raised through the sale on these Wishbone Day items. 11. Is Wishbone Day an official awareness day worldwide or is it exclusive to Australia? Wishbone Day is the official International Awareness Day for Osteogenesis Imperfecta! It is the largest community awareness effort ever for OI. 12. What if Wishbone Day is not recognised where I live? Start Wishbone Day yourself. Get a group together, get your yellow on and start your conversations. 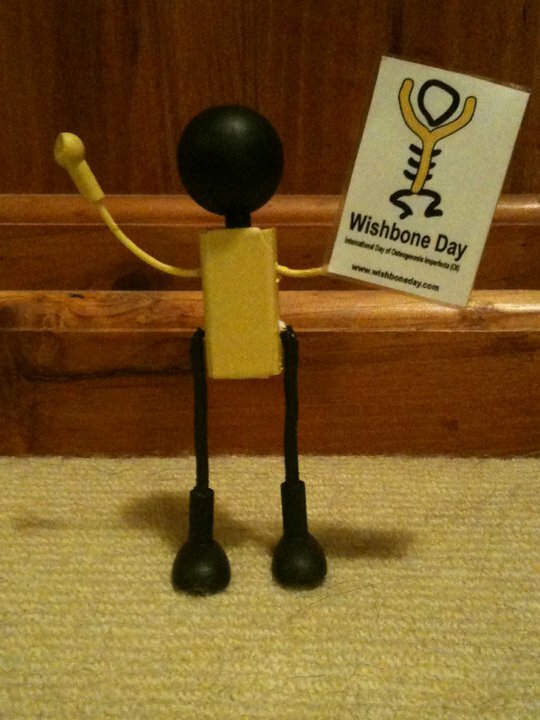 Let us know what you have planned and don't forget to share your Wishbone Day news on social media #WishboneDay. 13. Can my OI society or organisation get involved in Wishbone Day? Most definitely! We hope all OI associations worldwide will promote Wishbone Day as part of their annual celebrations to bring awareness to the lives of people with OI. Wishy is Wishbone Day's mascot! You'll also see Wishy as the Wishbone Day logo. You can read more about Wishy's Big Adventure here. Wishy is travelling the world, meeting as many of our OI community as possible. He started planning his iternary on the 8 May 2011 (with Jo's help). So far, he's had a ball visiting LA and Disneyland, attended the 2011 OIFE Conference in Dubrovnik Croatia with Ute, finally met Rafa and others in Sevilla Spain, travelled to Omaha USA with Avery and Mary to visit with Dr Esposito at the OI Clinic. Wishy really is criss-crossing the globe! Wishy has his own Facebook page here. If you would like Wishy to visit your place let us know. 15. Your question not answered here? Have you joined our Wishbone Day tribe?